it is our pleasure to announce that Kevin Brown of U.S. Water has been selected as the winner of our 2018 Paul Cohen Award for his presentation IWC 18-32: Decreasing Filterable Iron Levels in an Air-cooled Condenser at a Combined Cycle Power Plant. As a memorial to Paul Cohen and his contributions to the power generation industry, the IWC recognizes the author of the most precise and innovative presentation in the field of power systems water technology that was presented at the most recent IWC. Design Lives Here is a semester-long engineering initiative that equips teachers and students to participate in engineering activities within their school or afterschool program. Professional engineers serve as mentors to students throughout the year. Schools who participate are diverse – public, parochial and private – and have the option of making this part of their school day or an extended program. Each spring, all the participants come together for a day of engineering challenges, grouped in new teams to compete for prizes. Design Lives Here activities are inspired by the popular PBS KIDS program and website, Design Squad Nation. The 2018-2019 Design Lives Here initiative is a project of WQED Multimedia, with major underwriting by The Arconic Foundation, MSA, PPG, ANSYS, and additional support from Rolls-Royce, Arconic, Daedalus, Independence Excavating, and founding partner the Engineers’ Society of Western PA.
Design Lives Here’s day of engineering challenges are taking place on March 13 and 14, 2019 at WQED Multimedia. Good luck to all the schools participating in this event. To learn more about the program, please visit https://www.wqed.org/education/designliveshere. Congratulations to William Detwiler, P.E., T.Y. Lin International, Liji Huang, Ph.D., CCCC Highway Consultants Co., Ltd., Jennifer Laning, P.E., Pennoni, and Frank Russo, P.E., Michael Baker International on their election on the International Bridge Conference Executive Committee. Mr. Detwiler is a Senior Bridge Engineer & Principal Project Manager at T.Y. Lin International in their Coral Gables, FL office. Mr. Detwiler is currently managing the Design Review of the $800M I395/SR836/I95 Design/Build project for the Florida Department of Transportation. He has over 25 years of experience in bridge engineering including inspection, preservation, repair and rehabilitation projects and design experience in both concrete and structural steel, including box girder bridges and segmental construction. Mr. Huang began the study Civil Engineering in the Department of Civil Engineering, Tsinghua University, Beijing, China. After nine years of study, he received a Ph.D. degree in Civil Engineering, and joined CCCC Highway Consultants Co., Ltd. He has devoted his career to bridge design, consulting and research ever since he joined CCCC. CCCC was founded in 1954. The company undertakes the survey, design, construction, inspection, and maintenance of large bridges and tunnels in China and overseas. Mr. Huang will be the first International Bridge Conference representative from China. Ms. Laning is an Associate Vice President in the Transportation Division with a primary focus in bridge inspections and project management. She serves Pennoni as a Bridge Inspection Practice Leader, headquartered in the Baltimore, Maryland office. Her responsibilities include project management and quality management of NBIS Bridge and underwater inspection projects and coordination of relevant project requirements for local, state and federal clients. Mr. Russo is the Vice President and Technical Director at Michael Baker International. As a member of the Baker Technical Services Group for bridges, he is responsible for the design, design oversight, quality control, and marketing support of complex bridge engineering projects nationwide. He has an extensive teaching background in academia and for professional clients. He also has experience in forensic engineering and expert witness report preparation. We are pleased to welcome each of these candidates to IBC Executive Committee and we look forward to their assistance in the planning for the 2019 International Bridge Conference, which takes place on June 10-12, 2019 at the Gaylord National Resort and Convention Center in National Harbor, MD, USA. For more information on the event visit, https://eswp.com/bridge/bridge-home/. 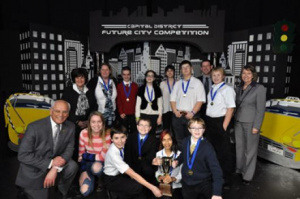 Congratulations to New Lebanon Jr/Sr High School for winning the 2015-2016 Capital District Future City Competition! Their city, “Marhielo” took first place overall in the competition on January 9. A list of all the winners can be found here. CANONSBURG, PA, Feb. 14, 2019 – Venkee Sharma, CEO of Aquatech International, has been appointed to serve on the U.S. – India CEO Forum. Established in 2005, this Forum provides an opportunity for dialogue between the United States and Indian governments to strengthen the economic and commercial relationship between both countries. The announcement was made by U.S. Secretary of Commerce, Wilbur Ross, who will co-chair the Forum with Indian Minister of Commerce & Industry and Civil Aviation Suresh Prabhu. “The U.S.-India CEO Forum is critical to the fruitful commercial relationship and strong economic ties between our two great nations. The incoming U.S. CEOs will bring fresh perspectives to the Forum and help us consider new opportunities to further deepen our cooperation,” he said. “It is an honor to be part of this CEO Forum, which plays an important role in encouraging economic opportunities and strengthening important business relationships in both our countries. While Aquatech is headquartered in the United States, our global operations include a significant presence in India which includes global technical services, R&D, as well as an appreciable footprint in the local market. This affords us a unique and beneficial perspective that we can bring to the Forum,” said Sharma, who will serve a two-year term on the Forum. 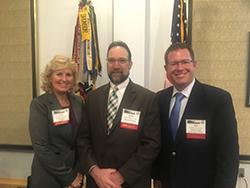 On February 12, ESWP was pleased to partner with the Society of American Military Engineers (SAME) in presenting a program on the Emergency Rehabilitation of Route 30, presented by Cheryl Moon-Sirianni, P.E., District Executive of PennDOT District 11-0; Brian Heintzl, P.E., of Gannett Fleming, and Eric Klimas, P.E., of Golden Triangle Construction. The three presenters provided a very informative inside look into the analysis, planning, and construction required to bring Route 30 “back to life” in less than three months, following the major collapse of this busy State highway, which carries 25,000 motor vehicles daily. The Route 30 Rehabilitation was recently recognized by the ESWP as the 2018 Emergency Rehabilitation Project of the Year. To learn more about this project, visit the ESWP Awards Page, found here. And a good time was had by all! 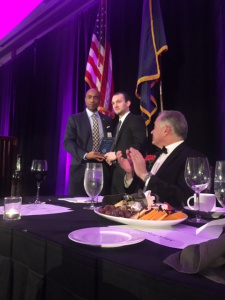 The 135th ESWP Annual Banquet was held last night at the Westin Convention Center Hotel with great fanfare! More than 430 guests attended the event, believed to be among the longest running awards dinner in the United States! You can view the award recipients on our website link here and we will post photos of the event as soon as they are available. Pictured here is University of Pittsburgh Dean of Engineering James Martin, with George Washington Prize winner Nate Carnovale, with ESWP President Bob Ward in the foreground. Thanks to all for supporting this very important engineering gathering. And congratulations to all of our award recipients! Scottsdale, Arizona was the new destination for the 79th Annual International Water Conference that took place on November 4-8, 2018. It brought together almost 900 end users, researchers, practicing engineers, educators, suppliers and contractors from more than 15 countries to learn unbiased details about the latest applications available in the industry, get educated on current technology and hold wide ranging discussions with their peers active in water treatment. The conference opened on Sunday at 10:00 AM local time with an IWC Golf Outing at the Talking Stick Golf Club. It was followed by Continuing Education Workshops, Outdoor Exhibit Hall, and Get Acquainted Reception. The Golf Outing and Outdoor Exhibit Hall are a new addition to the conference, pleasantly surprising attendees. To continue the excitement, the IWC introduced a H20 Theatre on Monday and Tuesday. The H20 Theatre offered a chance for companies to present information about their company that they could not present in the technical sessions. In addition, an Idea Board was added for attendees to communicate their thoughts in real time! The final addition to the conference was a TopGolf Outing hosting over 50 attendees on Wednesday evening located less than a mile from the venue. Over the 5-day conference, 75 technical papers and 18 Continuing Education Workshops were conducted. All are carefully peer reviewed for quality and to ensure they are non-commercial. Each paper presentation at the IWC is followed by a prepared discussion-a thoroughly considered, different perspective on the topic. This was followed by an open floor discussion when all audience members and presenters can fully interact-ask questions, seek clarification, and raise alternative viewpoints. Overall, we want to thank all the attendees, sponsors, and committee members for contributing to a successful conference and we hope to see you for the 80th Anniversary of the International Water Conference taking place on November 10-14, 2019 at the Hilton Lake Buena Vista in Orlando, FL, USA.